Opening and running a bookstore can’t be an easy feat. Between keeping the bestsellers on the shelves and fighting the competition of online booksellers, the owners of Literati Bookstore, Michael Gustafson and his wife Hilary, weren’t going to be deterred from their dream of owning a bookstore. When they opened the doors on the first day one of the first things they did was set out a light blue Olivetti Lettera 32 typewriter on the lower level of the bookstore. Anyone could use the typewriter all the booksellers had to do was keep paper by its side. It was a hit. That first they they heard the sounds of typing. What were the customers typing? Would they find love notes, confessions, funny anecdotes? This book is a compilation of how one typewriter in a bookstore helped build a community. There are some charming stories of proposals, friendships and even one of a boy meeting the Violin Monster who can be seen around the streets of Ann Arbor. 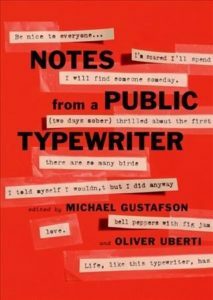 If you love books, bookstores and typewriters you must read this book. I love that there are also pictures of the bookstore scattered throughout the pages, some photos of the typewriter in use and even of the Wall of Fame of typewritten notes. This sounds like such a delightful book! 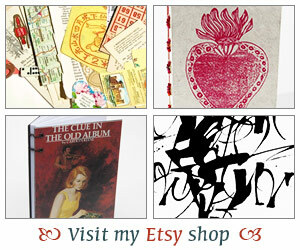 It would probably make a great gift for any book lover or bookstore employee. Thanks, Iliana! That would be really interesting to check day-by-day, I think. Who knows what people would write? I may look for this book at some point. Les in OR – Oh yes, this would be a great gift! Have to remember that around the holidays or for special occasions! Jenclair – Typewriter in the park is too cool. Thank you for sharing the article. Have you heard of Typewriter Rodeo? I missed seeing them when they were in town promoting their book but I just love stuff like this. This book has such an interesting premise. Will have to check it out. I think this book will be difficult to find without actually buying it, but I’ll keep it on my radar anyway. Thanks! What a fun and interesting idea! This sounds like quite a find! What a great sounding book!